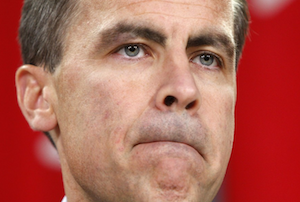 Bank of England boss Mark Carney announces a global plan to make banks cover their own losses. Sometimes you need a little tough love. Sick of bailing out their toxic asset junkie commercial cousins, the world’s central banks have agreed on a plan to force them to clean up their own mistakes. Mark Carney, speaking in his capacity as chair of G20’s Financial Stability Board (FSB), announced that the world’s biggest banks would need in future to be bailed out by their own creditors, by raising hundreds of billions of pounds in debt that would then convert to equity in the event of a 2008-style collapse. The FSB was created by the G20 in 2009 to oversee the global financial system, and has been working for years on an agreement that would prevent the need for further eye-watering government bailouts. Carney hailed the agreement, which will come into effect in 2019 if accepted by the G20 in Brisbane this week, as a ‘watershed in ending "too big to fail" for banks’. He said that, once implemented, ‘these agreements will play important roles in enabling globally systemic banks to be resolved without recourse to public subsidy and without disruption to the wider financial system’. At the same time, he pointed out, it would end what was in effect the unfair subsidy for the big banks of having a governmental safety net – good news, presumably, for the burgeoning challenger banks. How the sprawling G-SIBS will respond to being told to get a haircut and get a job remains to be seen. Given the extent of the bailouts some of them received, they may not be in a position to complain.